A few years ago the National Bed Federation (NBF) & Sleep Council noted that retailers were not informing customers that all new mattresses, in particular, high-end mattresses were subject to settlement. This means that initially, body impressions would be more visible as the mattress fillings directly beneath the user are compressed. This article explains why settlement and indents need consideration when buying a new mattress. In our experience settlement can be a cause for unnecessary concern. Showing itself more in mattresses with a bigger span area such as king-size or super king sizes. It stands to reason that as you are only sleeping in an area the width of your body, the central and perimeter areas will be underutilised. After a few weeks, it may look like the sleeping areas are wearing quicker than the rest of the mattress but constant turning, rotating and using different parts of the sleeping area will in time equal out this pattern. Mattresses with very soft layers such as wool, wool cotton, are more prone to settlement and, therefore, constant twisting and rotating of the mattress whilst new is extremely important to even out the wear pattern. Even Vi-Spring, one of the premier mattress manufacturers, gives this essential information advising that initial body impressions are not a fault of the mattress but an intrinsic part of the mattress bedding in period. Funnily enough, cheaper end mattresses with minimal layers of wadding tend not to show body indents as there is so little wadding and upholstery to indent you tend not to notice it more readily. Of course, cheaper end mattresses will more than likely be polyester based and as polyester has a low rate of recovery and not a very long lifespan you will soon be primarily be sleeping directly on the spring unit. So what can be done about mattress settlement? Firstly not many people realise that the underlying layers used in the mattress will have an effect on how they settle. Foams as bridging / insulating layers are extremely resilient to this and in all of the starter mattresses, we sell (Origins range) we always add an inch layer of Reflex foam above the spring unit as the resilient bridge/dampener between the springs and the softer primary comfort layers. If this was not there then when you are compressing the comfort layers you will be doing so directly on the springs with absolutely nothing taking the strain. 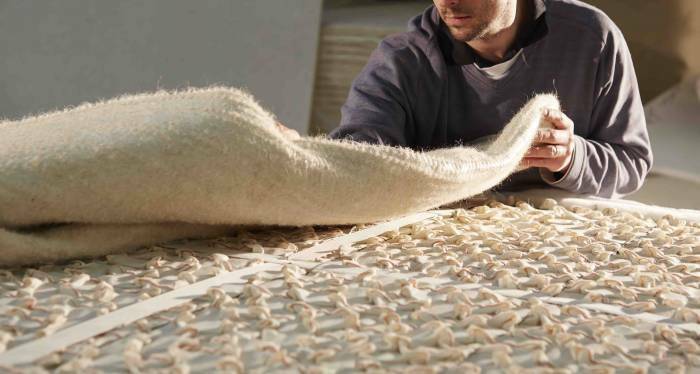 Absolute high-end mattresses with natural fibre upholstery, rather than polyester, utilise components such as horse hair, mohair, coir, bonded wool and cotton, cashmere blends and so forth as the insulator between the spring unit and upper layers. These products are entirely ‘forgiving’ and move in conjunction with the sleeper and the spring unit. These components are also completely and utterly fail-safe meaning that there is no possible way they can be depressed to such a level as to not return to their original loft. The general conception of all mattress builds is that there is progressive support from the spring unit upwards. This is to say that the components used directly beneath the primary soft comfort layer should be gradually increasing in tension. It then becomes quite obvious that as the mattress has a soft comforting primary layer such as wool, for example, the likelihood of compression indents within the bedding in period will be quite noticeable. We have a detailed article on the techniques of Mattress Construction which can be found here. Final (primary) layers of wool are included entirely for softness and comfort but have relatively little support or resilience properties. The addition of cotton to the wool supplements the properties with little detriment to the comfort properties. The layers directly below this must be components that offer an increasing degree of support to prevent you sinking right into the spring unit. 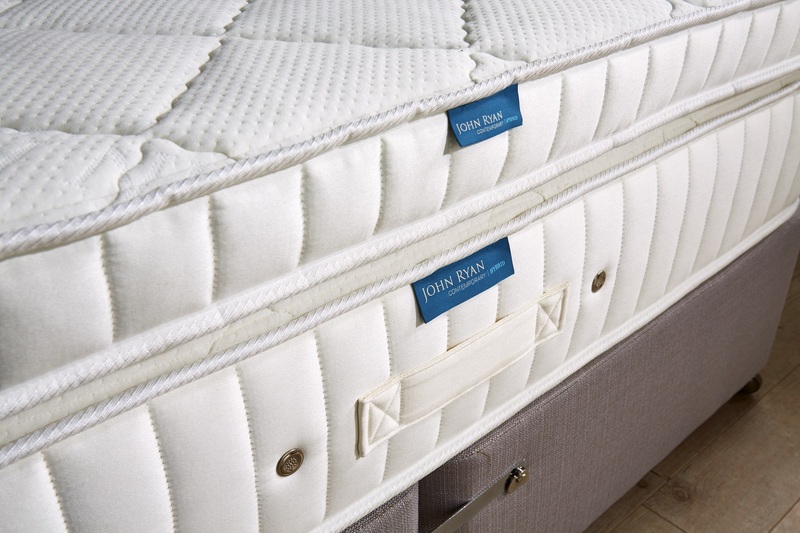 Bear in mind that all high-end mattresses will utilise either wool or wool blended with cotton as primary layers. As a good example, Vi Spring’s top of range model the Magnificence utilises a final comfort layer of 1200 gsm blended real Shetland Isle fleece wool and cotton. This particular model is backed up with underlying layers of additional wool (600 GSM) and then more supportive elements are introduced such as mohair (200 GSM). All of this represents the comfort layers. Additionally, below this, elements of support are introduced such as 610 GSM hand-opened and hand-teased long-stranded horsetail and 900 GSM blended real Shetland Isle fleece wool and cotton. If you take this particular build to be amongst the epitome of mattress construction and component usage, take for granted that even a mattress at this high level of build will have an element of depression from the wool as it is being bedded in it is not possible for a high-end component such as wool to retain its original loft. The bottom line is that settlement and indentations are going to occur in all mattresses. If a person was five foot wide and 6 foot high the depression and settlement would be equalised over the entire mattress. However, people are not the same size and shape of a mattress and, therefore, body-shaped impressions will occur. We always advocate the use of toppers to allow this settlement to happen slowly over time with the topper taking the brunt of your body weight rather than the primary layer of the mattress. If you need more advice please give our small expert team a call on 0161 437 4419.